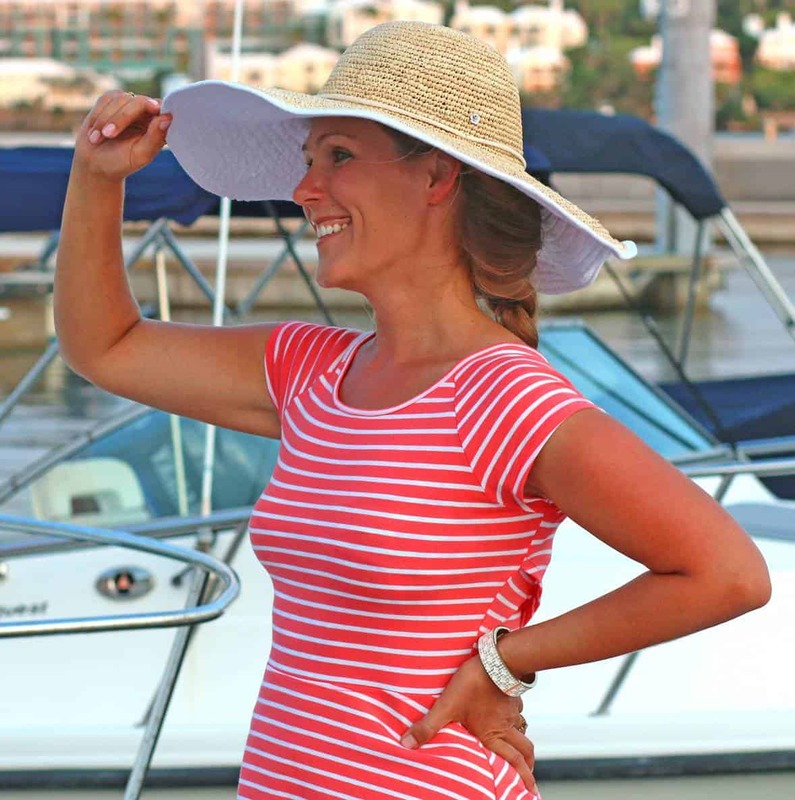 A special thank you to Aneto for sponsoring this post. 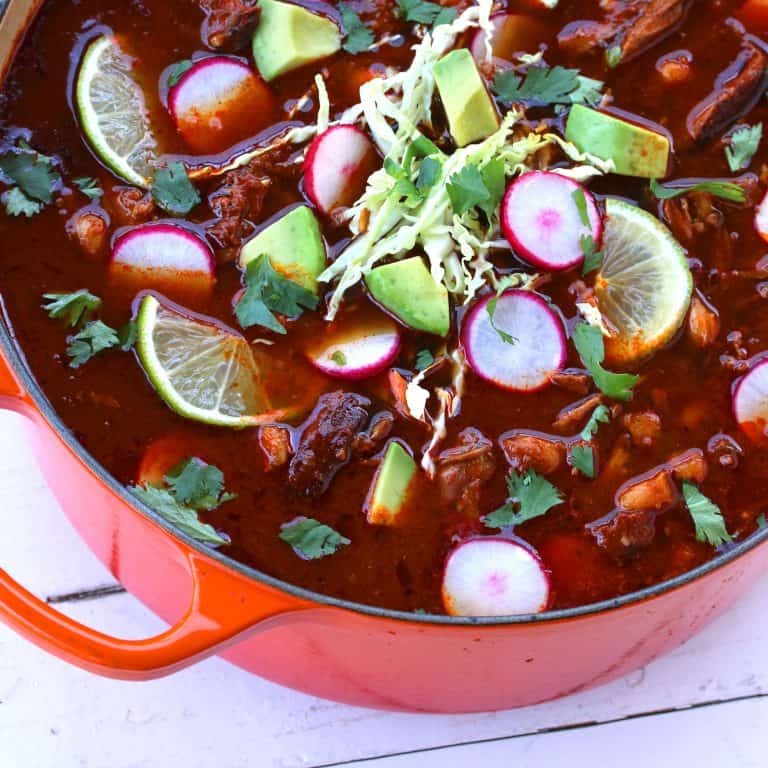 One of the most iconic Mexican dishes, this “ultimate” Pozole Rojo is PACKED with deliciously bold and robust flavors that will absolutely WOW your taste buds! 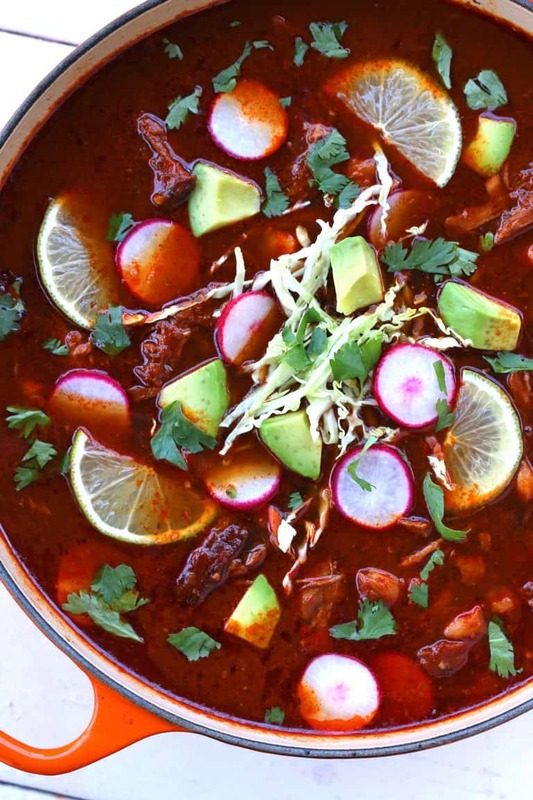 Pozole in Mexico is like chicken noodle soup in the United States – it’s a dish so engrained in our culture, traditions and way of life that it’s practically indispensable at the family table. Imagining life without it is, well, unimaginable. 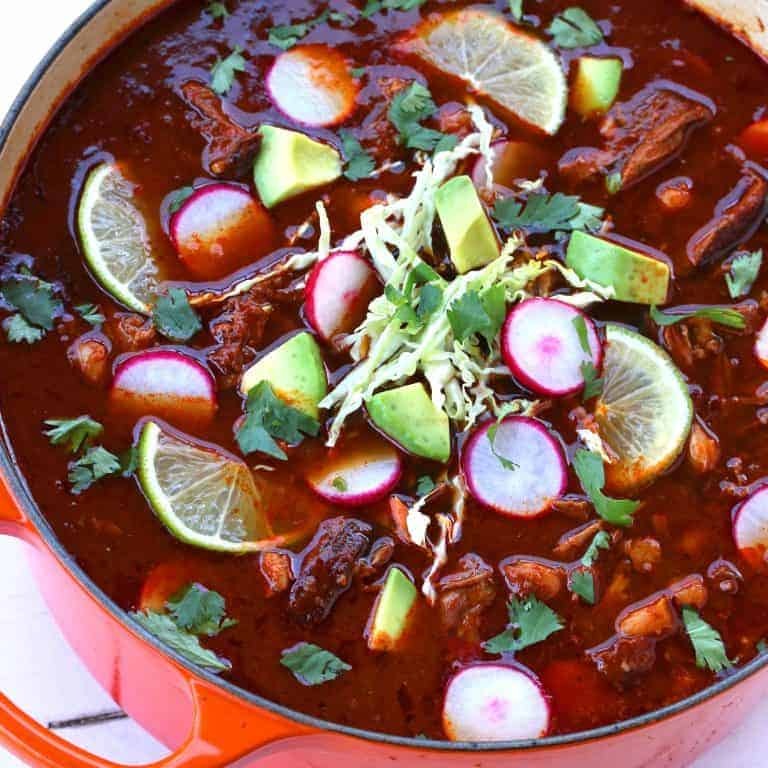 And on a cold and drizzly day or in the midst of feeling under the weather and needing some nutritious comfort, you just can’t beat a hot bowl pozole rojo. One of Mexico’s most iconic and popular dishes, pozole (some spell it posole) is served in Mexican restaurants worldwide. This traditional stew is popular in three varieties: Blanco (white) , Verde (green) and Rojo (red). As the names suggest, pozole verde is made with a green sauce (and usually chicken), pozole rojo is made with a red sauce, and pozole blanco is made without either green or red sauce. Today we’re making pozole rojo which incorporates a sauce made from roasted red chiles and garlic and has a depth of flavor that is simply unforgettable. Pozole is the Spanish word for “hominy”. Hominy are dried maize/corn kernels that have gone through a process called nixtamalization in which the dried kernels are soaked in lime to soften the outer hulls. The kernels are then washed and the hulls are removed, leaving them nice and chewy. Hominy has been a staple food throughout Mexico for centuries. 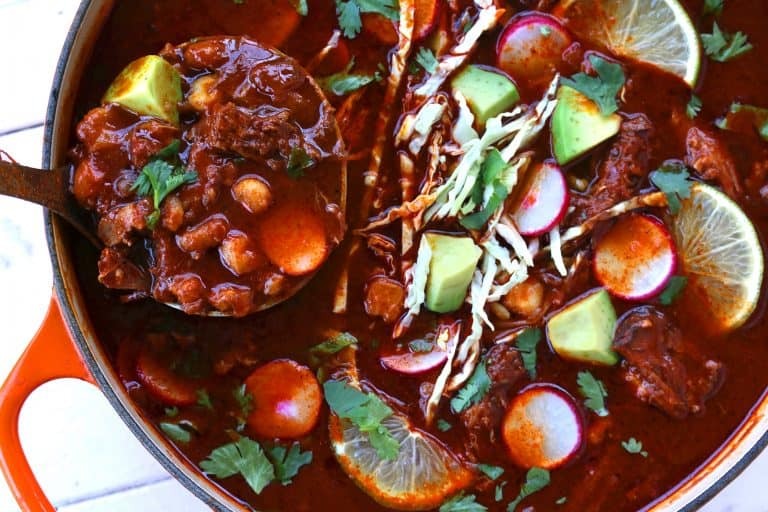 In fact, this famous pozole stew dates back to pre-hispanic times to the Aztecs. One of the fun features about this stew is its wide and colorful array of garnishes. Shredded cabbage, sliced red radishes, diced avocados, chopped cilantro and sliced limes are traditional and you can add any other toppings you like such as fried tortilla strips, sliced jalapeños or crema. Pozole Rojo is the king of add-ins! Why “ultimate”? 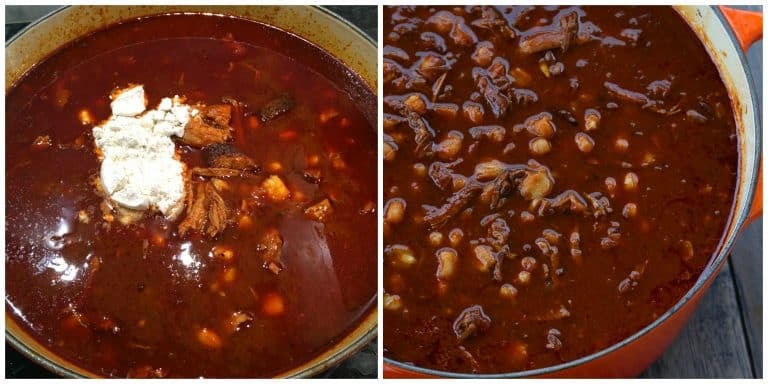 The flavor of this pozole rojo is especially rich and robust from the addition of the homemade roasted red chile sauce, the smoked paprika and the addition of masa harina for an extra boost of delicious corn flavor that the hominy alone can’t provide. Your taste buds will be WOWED! 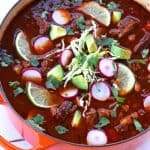 An absolute and non-negotiable key to making the ultimate pozole roja is making your own authentic red chile sauce. Don’t even think twice about it. Just make it. 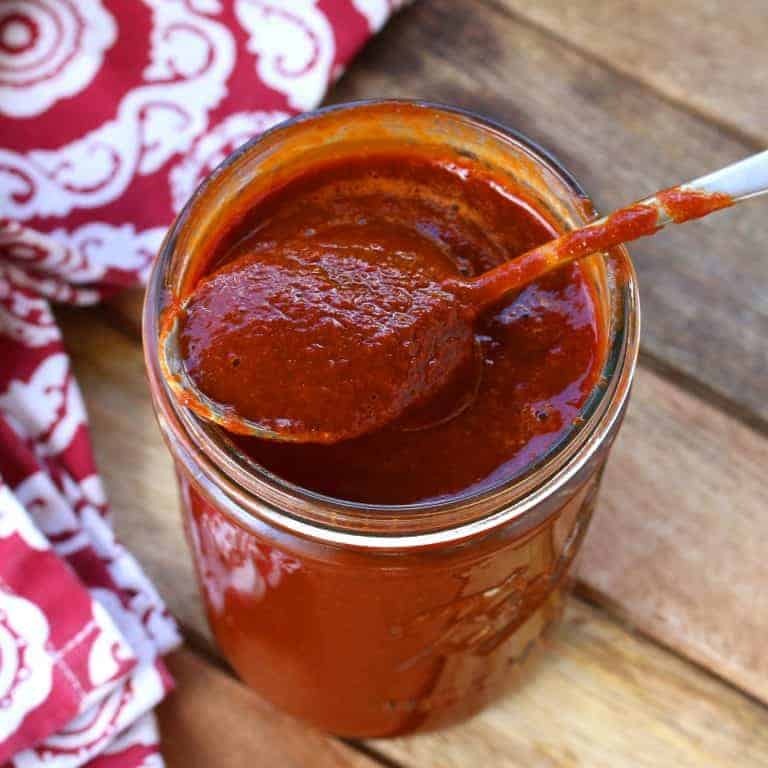 Here is the recipe: Homemade Authentic Red Chile (Enchilada) Sauce. This prize-worthy stew also deserves the very best chicken broth as its base, which is why we’re using our favorite chicken broth from Aneto, made in Spain. We’ve been fans for years and visited their factory in Barcelona a couple of years ago where we watched the entire broth-making process from start to finish. It was one of the most inspiring things we’ve ever seen. 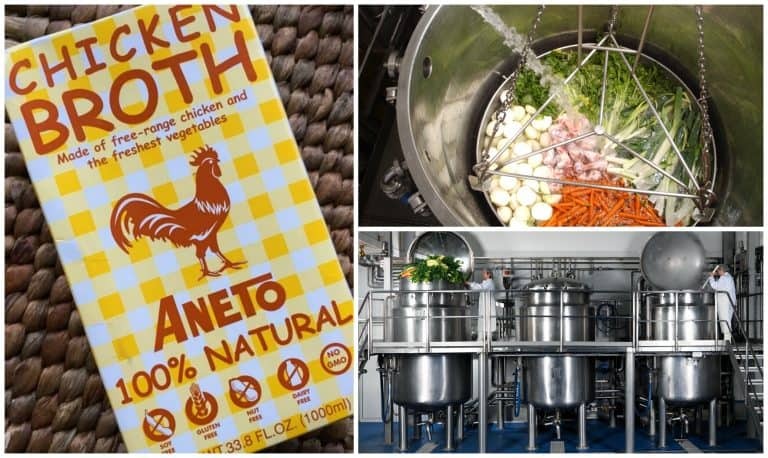 Aneto selects fresh, free-range chicken and the freshest vegetables and slow-simmer it in gigantic pots for several hours to produce the highest quality broths on the market. No concentrates, powders, artificial ingredients, “natural flavors”, GMO’s, fillers or flavor enhancers of any kind. Just pure, whole, real ingredients. You can read more about why we love Aneto broths so much and what sets them apart HERE. Their chicken broth can be purchased here on Amazon and in stores throughout the U.S. See list of store locations. And if you’re a paella fan, you MUST try their Valencian and Seafood paella cooking bases – incredible! Back to our Ultimate Pozole Rojo. This recipe makes a large batch on purpose – it’s so good you WILL want seconds. And so will your guests. What’s more, you’ll be so happy to have leftovers the next day or two, I promise! 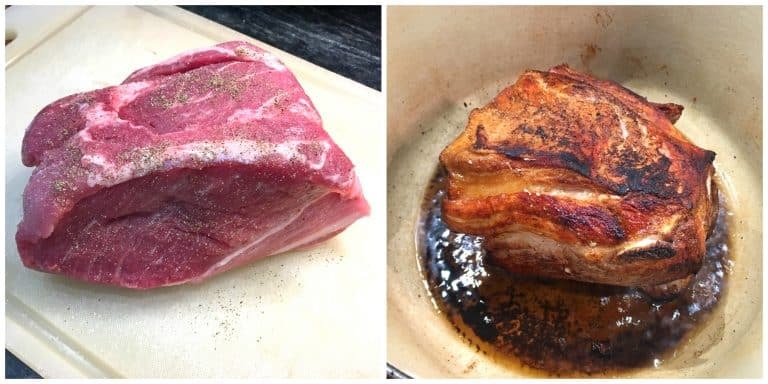 Rub the pork down with a little salt and some freshly ground black pepper. Heat the lard/oil over high heat in a heavy stock pot or Dutch oven and sear the pork on all sides until nicely browned. Remove and set aside. 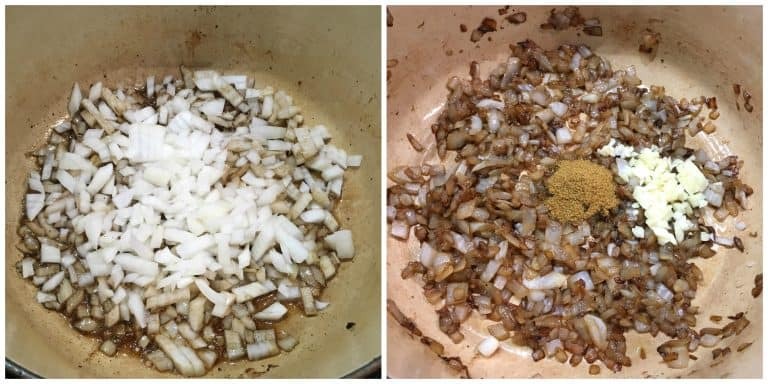 Lower the heat to medium-high and add the onions, cooking until lightly browned. Add the garlic and cumin and cook for another minute. Return the pork roast and add the chicken broth. Add the Homemade Authentic Red Chile Sauce along with the bay leaves, salt, pepper, Mexican oregano and smoked paprika. Simmer covered over low heat for 2-3 hours or until the roast is fork tender and falls apart. 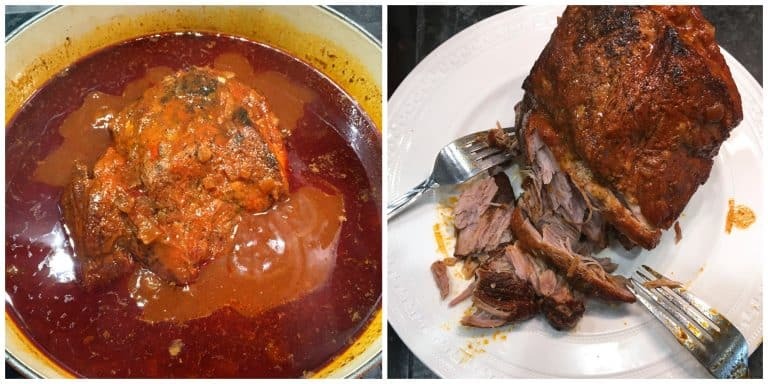 Transfer the roast to a plate and use two forks to shred the meat. Return the shredded pork to the pot, stir in the masa harina and add the drained hominy. Simmer covered for another hour. Stir in the cilantro and simmer another 5 minutes. Add more salt and pepper to taste. Serve garnished with shredded green cabbage, sliced red radishes, diced avocado, sliced limes, chopped cilantro and anything else your heart desires! Want some crunch? Add some toasted tortilla strips. 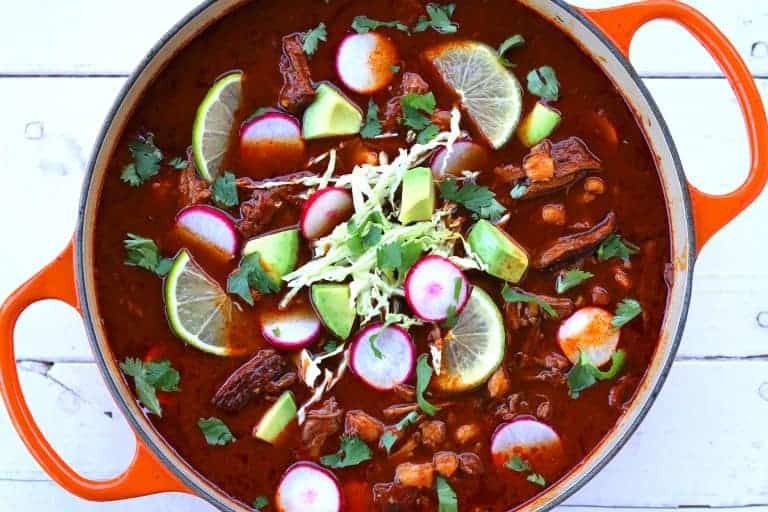 One of the most iconic Mexican dishes, this "ultimate" Pozole Rojo is PACKED with deliciously bold and robust flavors that will absolutely WOW your taste buds! For toppings: Shredded green cabbage, sliced red radishes, diced avocados, sliced limes, chopped fresh cilantro, toasted tortilla strips, crema, and anything else your heart desires! Serve garnished with shredded green cabbage, sliced red radishes, diced avocado, sliced limes, chopped cilantro, etc. Want some crunch? Add some toasted tortilla strips. Follow steps 1 and 2 as directed and then transfer everything to a slow cooker in step 3. Cook on LOW for 6-8 hours or on HIGH for 4-6 hours. Thank you to Aneto for sponsoring this post and to my readers for supporting the brands who help make The Daring Gourmet possible. What an amazing recipe! Such a great combination of flavors. Yummy! This looks so amazing, I cannot wait to make this for the whole family! I feel like I can actually see how flavorful this is! It looks so great – trying it soon! When I look at those pictures I can almost smell the deliciousness!! I love making authentic dishes! I absolutely love Mexican food but I’ve never tried this dish. Yours looks delightful and I am going to try it! This looks INCREDIBLE! I am wishing I had a bowl of this to enjoy right now! This seems to be the perfect fall meal. Looks so inviting! I love all the ingredients in this dish! Yummy! What a beautiful, low cal dish! This is my type of dinner! So flavorful! Looks so hearty! And the flavors sound amazing. This is great. I love all the step by step photos! Susan, I made it earlier this week and it’s incredible! My family LOVED it. They’ve requested it again for this week. I also made her homemade enchilada sauce which I agree is a must. SO good. Pam, I did. Of course you can use any chicken broth for this stew but I just really love Aneto. Their paella broths are sooooo good. I use the Valencian paella and seafood paella recipes on this blog, they’re my go-to recipes for paella and they use Aneto’s paella broths. Aneto’s broths are definitely pricey but for the quality of the ingredients and the method they use for making them, I feel they’re worth it. There’s a really good article on this blog all about how the broths are made, I think she links to it in this recipe post. 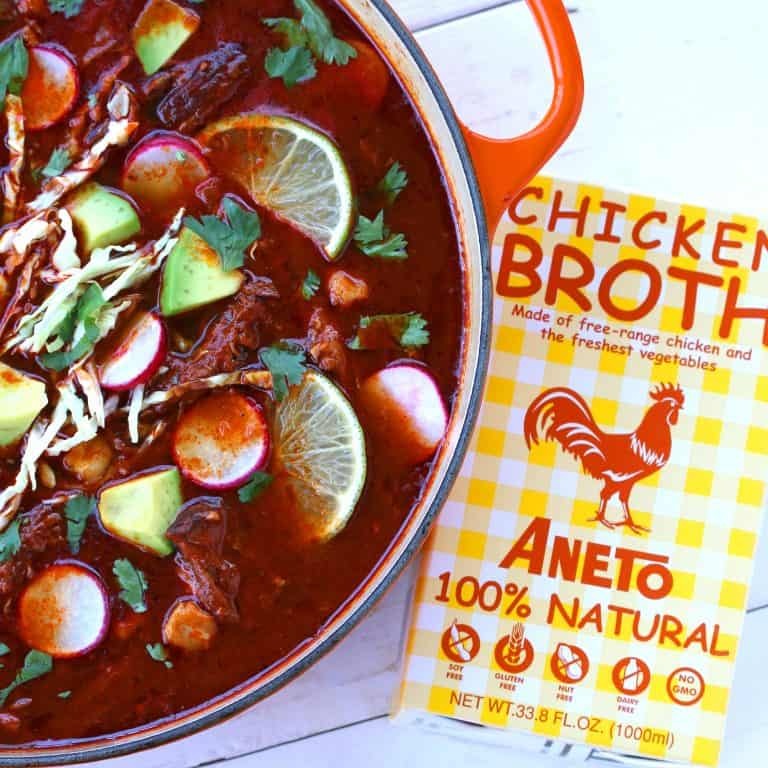 Sorry, I’m rambling, lol :) She gives a link to the store locater in this blog post where you can look up which stores in your state carries Aneto broths. That’s how I found mine. She also links to the Aneto broths on Amazon. 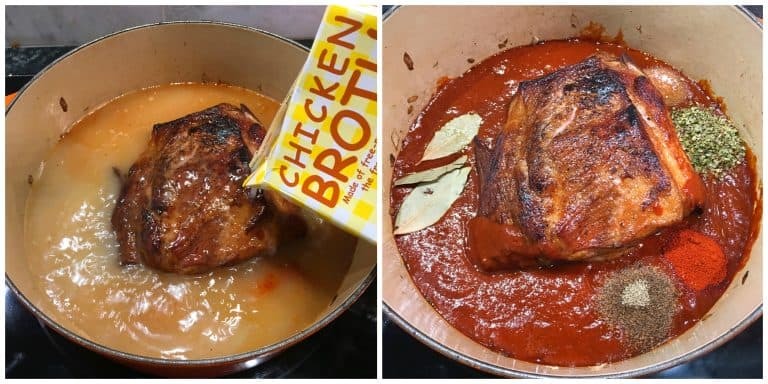 I usually buy the broths at my local store because Aneto’s broths are considerably more expensive on Amazon than what they sell for in the stores. But sometimes they sell the chicken broth in six-pack bundles and those are a better deal and more comparable to the store prices, so I’ll often buy those on Amazon when they have them. I’m so glad you enjoyed this, Natalie, thank you! I so enjoy authentic Mexican foods, and this dish looks amazing. All the varieties of garnishes are so inviting I can see myself on a cold winter day preparing and cooking this dish! Off to my Mexican store in the Westend of Winnipeg for some of the ingredients. This was absolutely delicious! I made it exactly as written including the homemade enchilada sauce. I added some arbol peppers to it because I like a bit of heat. The stew was incredibly flavorful and I look forward to having the leftovers for lunch tomorrow. Thank you! I’m thrilled to hear that, Terri, thanks so much for the feedback! Kimberly, OMG this was SO delicious! I made your enchilada sauce (used the red chilies you recommended, they’re awesome) and made this for my family for dinner tonight. I was the star of the evening, lol :) We all loved it! Keep these delicious recipes coming! I’m so thrilled to hear that, Cami, thank you! Love that homemade chili sauce. It really makes this recipe pop! This is absolutely stunning, Kimberly! I have it on my menu for next weekend and will gather the ingredients in the meantime, including ordering more of that wonderful Aneto broth. Can’t wait to try this! THIS WAS OUTSTANDING!! Really, I can’t rave enough about it. The flavor is out of this world. I made it for a small gathering of family last night and everyone loved it. Thank you for such a delicious recipe! Looks amazing. But I’m trying to click on the link for the red sauce it it’s just opening the link for the Dutch oven. Do you have this recipe somewhere else? Thank you! I am of Mexican heritage and this is the BEST pozole I have ever had!! Thank you for sharing!! I’m so thrilled to hear that, Margie, thank you!